' are translated into these. 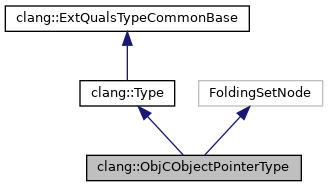 Pointers to pointers to Objective C objects are still PointerTypes; only the first level of pointer gets it own type implementation. Definition at line 5806 of file Type.h. An iterator over the qualifiers on the object type. Provided for convenience. This will always iterate over the full set of protocols on a type, not just those provided directly. Definition at line 5926 of file Type.h. Definition at line 5927 of file Type.h. Definition at line 5975 of file Type.h. Definition at line 5952 of file Type.h. If this pointer points to an Objective @interface type, gets the declaration for that interface. Definition at line 5862 of file Type.h. Referenced by clang::Sema::CheckMessageArgumentTypes(), checkSelfIvarsForInvariantViolation(), CompareDerivedToBaseConversions(), clang::Sema::ConversionToObjCStringLiteralCheck(), findMethodDecl(), getMostInformativeDerivedClassImpl(), clang::ObjCMethodCall::getRuntimeDefinition(), hasDefinition(), clang::ento::cocoa::isCocoaObjectRef(), isKnownNonNilCollectionType(), IsNSError(), and recordFixedType(). If this pointer points to an Objective C @interface type, gets the type for that interface. Any protocol qualifiers on the interface are ignored. Definition at line 1552 of file Type.cpp. References clang::Type::castAs(), clang::ObjCObjectType::getInterface(), and getObjectType(). Referenced by clang::Sema::BuildObjCExceptionDecl(), clang::ASTContext::canAssignObjCInterfacesInBlockPointer(), and clang::Sema::HandleExprPropertyRefExpr(). Return the number of qualifying protocols on the object type. Definition at line 5942 of file Type.h. Gets the type pointed to by this ObjC pointer. '. For 'A1PQ*', getObjectType() will return 'A1<Q>', because adding protocols to a protocol-qualified base discards the old qualifiers (for now). But if it didn't, getObjectType() would return 'A1P<Q>' (and we'd have to make iterating over qualifiers more complicated). Definition at line 5847 of file Type.h. Referenced by clang::ASTContext::areCommonBaseCompatible(), clang::ASTContext::canAssignObjCInterfaces(), clang::Sema::CheckObjCForCollectionOperand(), checkObjCKindOfType(), createBinOpInfoFromIncDec(), getMostInformativeDerivedClassImpl(), isNSStringType(), LookupMemberExpr(), and ShouldTryAgainWithRedefinitionType(). The result will always be an ObjCObjectType or sugar thereof. Definition at line 5822 of file Type.h. Referenced by clang::Sema::HandleExprPropertyRefExpr(), hasIsEqualMethod(), isTypeSubstitutable(), LookupMethodInReceiverType(), clang::CodeGen::CGDebugInfo::remapDIPath(), clang::CodeGen::CodeGenFunction::TypeOfSelfObject(), clang::ASTContext::UnwrapSimilarTypes(), clang::ASTNodeTraverser< Derived, NodeDelegateType >::VisitObjCObjectPointerType(), clang::ASTNodeImporter::VisitObjCObjectPointerType(), and clang::ASTTypeWriter::VisitTagType(). Retrieve a qualifying protocol by index on the object type. Definition at line 5947 of file Type.h. Retrieve the type of the superclass of this object pointer type. This operation substitutes any type arguments into the superclass of the current class type, potentially producing a pointer to a specialization of the superclass type. Produces a null type if there is no superclass. Definition at line 1561 of file Type.cpp. References clang::ASTContext::getObjCObjectPointerType(), getObjectType(), and clang::QualType::isNull(). Retrieve the type arguments for this type. Definition at line 5914 of file Type.h. Referenced by checkObjCArrayLiteral(), and checkObjCDictionaryLiteral(). Definition at line 5919 of file Type.h. Whether this is a "__kindof" type. Definition at line 5896 of file Type.h. True if this is equivalent to the 'Class' type, i.e. if its object tive is the primitive 'Class' type with no protocols. Definition at line 5874 of file Type.h. Referenced by CompareDerivedToBaseConversions(), clang::ento::cocoa::isCocoaObjectRef(), and LookupMethodInReceiverType(). True if this is equivalent to the 'id' or 'Class' type,. Definition at line 5879 of file Type.h. True if this is equivalent to the 'id' type, i.e. if its object type is the primitive 'id' type with no protocols. Definition at line 5868 of file Type.h. Referenced by clang::ASTContext::canAssignObjCInterfacesInBlockPointer(), canAssignObjCObjectTypes(), CompareDerivedToBaseConversions(), clang::Sema::ConversionToObjCStringLiteralCheck(), hasIsEqualMethod(), clang::ento::cocoa::isCocoaObjectRef(), isObjCTypeSubstitutable(), and recordFixedType(). True if this is equivalent to 'Class.
' for some non-empty set of protocols. Definition at line 5891 of file Type.h. True if this is equivalent to 'id. Definition at line 5885 of file Type.h. 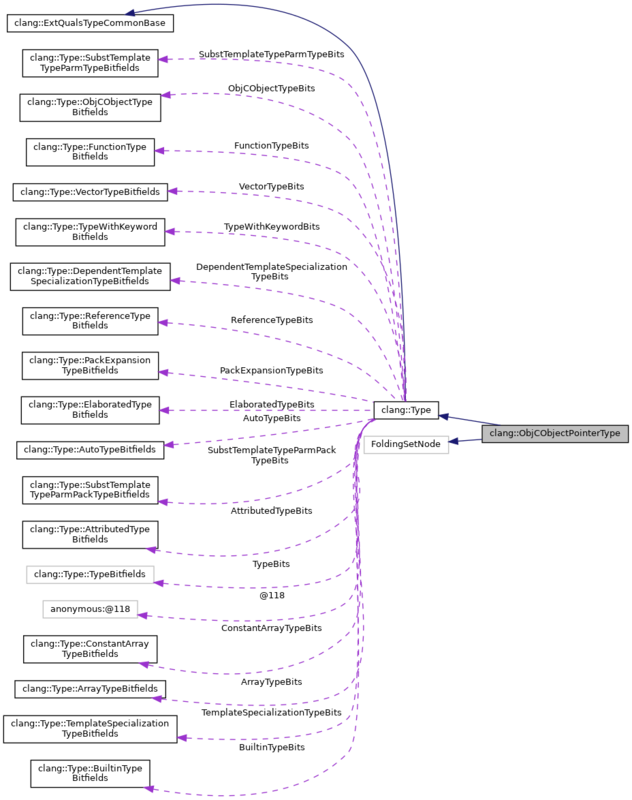 Referenced by clang::ASTContext::canAssignObjCInterfacesInBlockPointer(), clang::ento::cocoa::isCocoaObjectRef(), isObjCTypeSubstitutable(), and clang::CodeGen::CGDebugInfo::remapDIPath(). Whether this type is specialized, meaning that it has type arguments. Definition at line 5899 of file Type.h. Referenced by CompareDerivedToBaseConversions(), getMostInformativeDerivedClassImpl(), and hasDefinition(). Definition at line 5902 of file Type.h. Definition at line 5951 of file Type.h. Whether this type is unspecialized, meaning that is has no type arguments. Definition at line 5907 of file Type.h. Determine whether this object type is "unspecialized" as written, meaning that it has no type arguments. Definition at line 5911 of file Type.h. Definition at line 5967 of file Type.h. Definition at line 5971 of file Type.h. Definition at line 5931 of file Type.h. Definition at line 5939 of file Type.h. Definition at line 5935 of file Type.h. Definition at line 5929 of file Type.h. Referenced by clang::Sema::LookupMethodInQualifiedType(), clang::ASTContext::ObjCQualifiedClassTypesAreCompatible(), and clang::ASTContext::ObjCQualifiedIdTypesAreCompatible(). Strip off the Objective-C "kindof" type and (with it) any protocol qualifiers. Definition at line 717 of file Type.cpp. References clang::Type::castAs(), clang::ASTContext::getObjCObjectPointerType(), getObjectType(), clang::ObjCObjectType::isKindOfType(), clang::QualType::isNull(), clang::ObjCProtocolQualifiers< ObjCObjectType >::qual_empty(), clang::SplitQualType::Quals, clang::QualType::split(), and clang::SplitQualType::Ty. Referenced by clang::ASTContext::canAssignObjCInterfaces(), clang::ASTContext::canAssignObjCInterfacesInBlockPointer(), and hasDefinition(). Definition at line 5807 of file Type.h.